On December 19, at Taiho in Ogimi Village, an Okinawan rail that recovered after being attacked by crows was released into the forest. 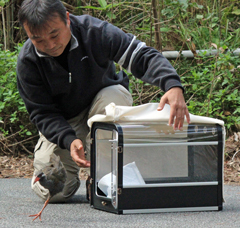 On December 19, a male Yambaru kuina or Okinawan rail that was saved from an attack by crows near the Okuni Forest Road in Taiho, Ogimi Village was released back into the forest. The place in which the Okinawan rail was rescued is at the southern limit of the Yambaru kuina. In order to protect the habitat of the bird, Okinawa Animal Hospital member Michio Kinjo, who looked after the rail, called for the extermination of crows and cats, which have increased in numbers because of human activity in the area. Based on the pattern on its feathers, the rail in question seems to be a young bird. On November 27 at the Taiho Dam, a worker found the Okinawan rail after it had been attacked by several crows and reported the incident. When the Okinawan rail was found, it could hardly move, and was bleeding from its head and neck, with a scratch on its back and a hole in its head from being pecked by the crows. After being released, the Okinawan rail ran quickly into the forest. According to Kinjo, three Okinawan rails have been seen in the Taiho area.